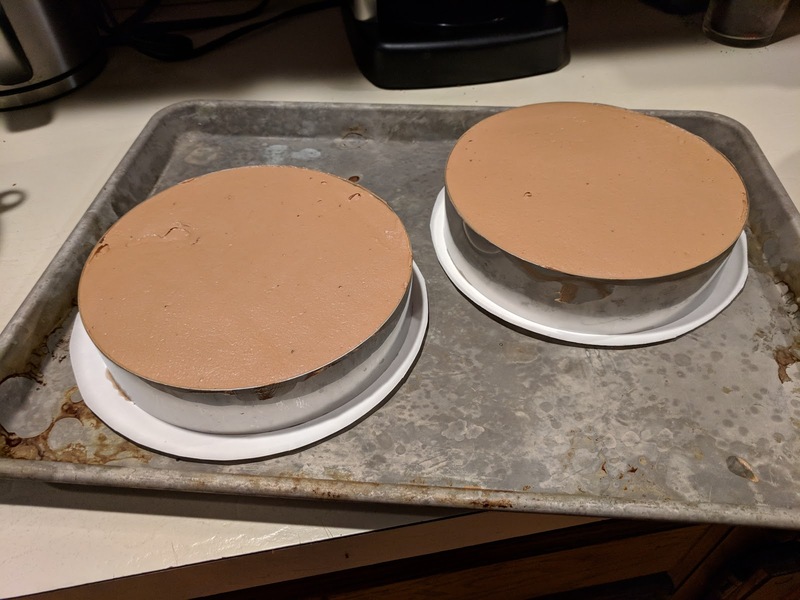 Step 3 was to make the chocolate mousse and the raspberry syrup and assemble the cake. For the syrup I tried to cut corners and use some of the raspberry syrup I've canned but I shouldn't have. I did heat it up but it was still a little too heavy for soaking cakes. In the future I should remember to use the lighter syrup and follow Chef's directions. Anyway. The mousse. First I used one stand mixer bowl and whisk to make the mousse base, with the egg yolks and the sugar syrup and the chocolate. While that cooled, I chilled the second mixer bowl and whisk in the freezer, washed the first one, and made Italian meringue. Finally, I made whipped cream in the chilled bowl with the chilled whisk. 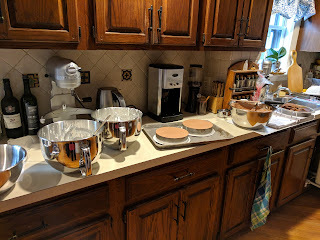 Once all three things were combined I had chocolate mousse and it was time to assemble the cake. The cake layers (1 per cake) had their tops and bottoms sliced off and then they were soaked in the raspberry syrup. These were placed in the rings. I then used some of my raspberry jam and piped a spiral of jam on top of the cake. I meant to get a picture at this point but I was just too sticky. The next step was to fill the rest of the ring with the mousse and smooth it. These went back into the fridge to chill and set. The rest of the mousse was divvied up into little ramekins for desserts over the next few days and the youngerchild and I ate the rest!